How do your eyes work? There are many different parts of the eye that help to create vision. We “see” with our brains; our eyes collect visual information and begin this complex process. Light passes through the cornea, the clear, dome-shaped surface that covers the front of the eye. The cornea bends – or refracts – this incoming light. The iris, the colored part of the eye, regulates the size of the pupil, the opening that controls the amount of light that enters the eye. Behind the pupil is the lens, a clear part of the eye that further focuses light, or an image, onto the retina. The retina is a thin, delicate, photosensitive tissue that contains the special “photoreceptor” cells that convert light into electrical signals. These electrical signals are processed further, and then travel from the retina of the eye to the brain through the optic nerve, a bundle of about one million nerve fibers. Eye diagram showing the macula and fovea (black and white).NEI Catalog number NEA09. How can you keep your eyes healthy? Incorporate your eye health as part of your regular health check-ups. Having a comprehensive dilated eye exam is one of the best things you can do to make sure that you’re seeing the best you can and that you’re keeping your eyes healthy. Millions of people have problems with their vision every year. Some of these problems can cause permanent vision loss and even blindness, while others are common problems that can be easily corrected with glasses or contact lenses. 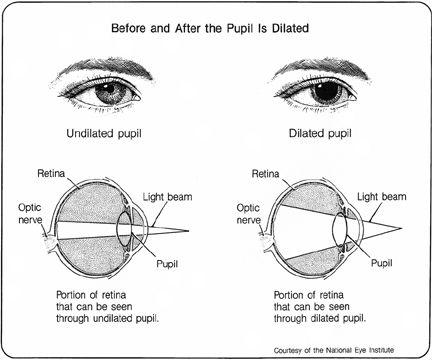 A comprehensive dilated eye exam is a painless procedure in which an eye care professional examines your eyes to look for common vision problems and eye diseases, many of which have no early warning signs. Regular comprehensive eye exams can help you protect your sight and make sure that you are seeing your best. National Eye Institute doctor discusses the importance of having a dilated eye exam. Have a comprehensive dilated eye exam. A dilated eye exam is the only way to detect many common eye diseases such as glaucoma, diabetic eye disease and age-related macular degeneration in their early stages. Know your family’s eye health history. It’s important to know if anyone has been diagnosed with a disease or condition since many are hereditary. This will help to determine if you are at higher risk for developing an eye disease or condition. Eat right to protect your sight. Eating a diet rich in fruits and vegetables, particularly dark leafy greens such as spinach, kale, or collard greens is important for keeping your eyes healthy, too. Research has also shown there are eye health benefits from eating fish high in omega-3 fatty acids, such as salmon, tuna, and halibut. Maintain a healthy weight. Being overweight or obese increases your risk of developing diabetes and other systemic conditions, which can lead to vision loss, such as diabetic eye disease or glaucoma. If you are having trouble maintaining a healthy weight, talk to your doctor. Wear protective eyewear. Protective eyewear includes safety glasses and goggles, safety shields, and eye guards specially designed to provide the correct protection for a certain activity. Quit smoking or never start. Smoking is as bad for your eyes as it is for the rest of your body. Research has linked smoking to an increased risk of developing age-related macular degeneration, cataract, and optic nerve damage, all of which can lead to blindness. Be cool and wear your shades. Sunglasses are a great fashion accessory, but their most important job is to protect your eyes from the sun’s ultraviolet rays. When purchasing sunglasses, look for ones that block out 99 to 100 percent of both UV-A and UV-B radiation. Clean your hands and your contact lenses–properly. To avoid the risk of infection, always wash your hands thoroughly before putting in or taking out your contact lenses. Make sure to disinfect contact lenses as instructed and replace them as appropriate. Practice workplace eye safety. Employers are required to provide a safe work environment. When protective eyewear is required as a part of your job, make a habit of wearing the appropriate type at all times and encourage your coworkers to do the same. Smoking. Research shows that smoking increases the risk of AMD two-fold. Race. Caucasians are much more likely to get AMD than people of African descent. Family history. People with a family history of AMD are at higher risk.